GPU-Z is a lightweight and reliable software application which was designed to provide you detailed data about your GPU (Graphics Processing Unit) and graphics card. 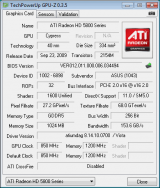 This small but powerful utility is able to support ATI, NVIDIA and Intel graphics devices, showing you information about your graphics hardware. You can use this program to see the default clocks, overclock or 3D clocks (if available) of your GPU. GPU-Z includes a load test utility that will help you check the PCI-Express lane configuration. You can also use this tool create a backup of your graphics card BIOS. GPU-Z does not require installation on your machine and is compatible with Microsoft Windows XP, Vista, Windows 7, Windows 8 and 8.1, both 32-bit and 64-bit versions. It's lightweight and does not require installation. It's fast, reliable and will display accurate card information. It doesn't support some graphic card manufacturers. Novice users might not understand some technical terms and find the displayed data confusing. GPU-Z has been tested by Download82.com team against viruses, spyware, adware, trojan, backdoors and was found to be 100% clean. Our editors will recheck this software periodically to assure that it remains clean.